If you need special entertainment for your family get-together, adult birthday, bachelor or bachelorette party, wedding reception, holiday party, banquet, grand opening, trade booth, or other special event then LOOK NO FURTHER! Terry Runyon, Master Comedy Magician, will add that special zing to your event with his unique brand of magic that leaves you laughing at the same time you ask "how did he do that?" Choose Mr. Runyon's 45 minute magic show when you prefer to entertain all your guests at one time. 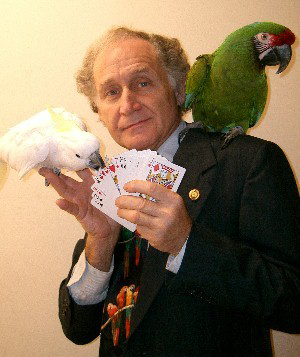 His show includes sponge balls that mysteriously appear then vanish in a volunteer's hand, a funny test for ESP in a married couple, "Louie the Mind-Reading Cockatoo" (link to info and picture of Louie on “Animal Performers” page) performing a “bird-brained” card trick with an audience volunteer, and ends with someone (almost) losing their head in Terry's Jumbo Veg-A-Matic, also known as a "Head Chopper." A fun-loving group is a must! 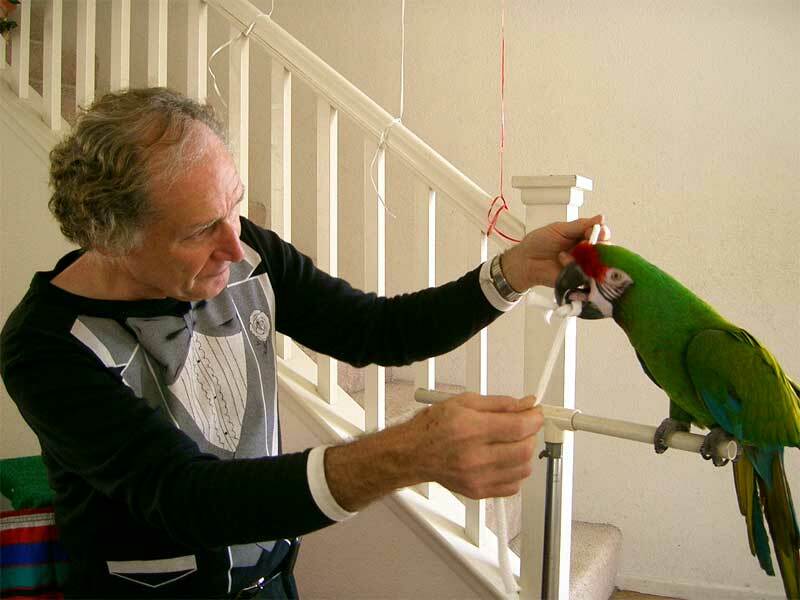 Mr. Runyon will entertain "close-up and personal" by mingling with your guests (walk-around magic) or performing from table to table. His close-up magic combines card and coin effects, mentalism, sleight of hand, and lots of laughs! Close-up (walk-around) magic is best for informal situations like entertaining your guests during a cocktail hour prior to a banquet or other function, a house party where your guests are in multiple areas of the house and cannot gather in one single area to watch a stand-up magic show, or to draw attention to your company’s booth at a trade show or store at a grand opening. 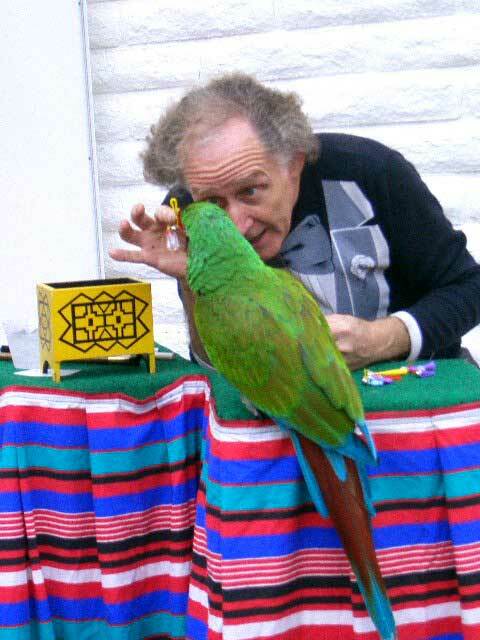 Please note that “Louie the Mind-Reading Cockatoo” and “Clyde the Magic Macaw” are NOT included in the walk-around magic format. 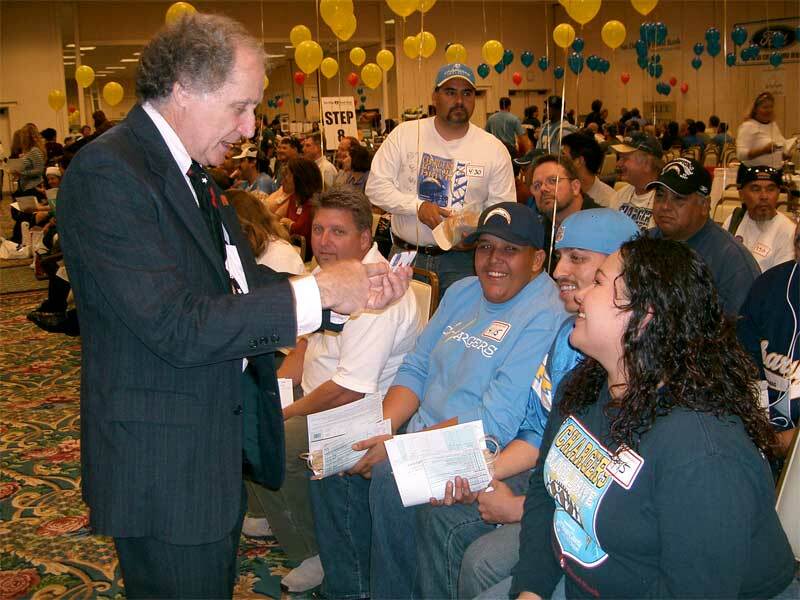 If you have a really fun-loving adults only group then - at your request only - Mr. Runyon can perform his special brand of “blue” magic, either stand-up or walk-around. Also included are some really funny and a little “naughty” balloon sculptures. No prudes allowed! 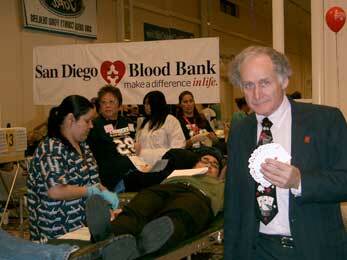 2007 San Diego Blood Bank Chargers Blood Drive. Keeping blood donors entertained is a serious business! 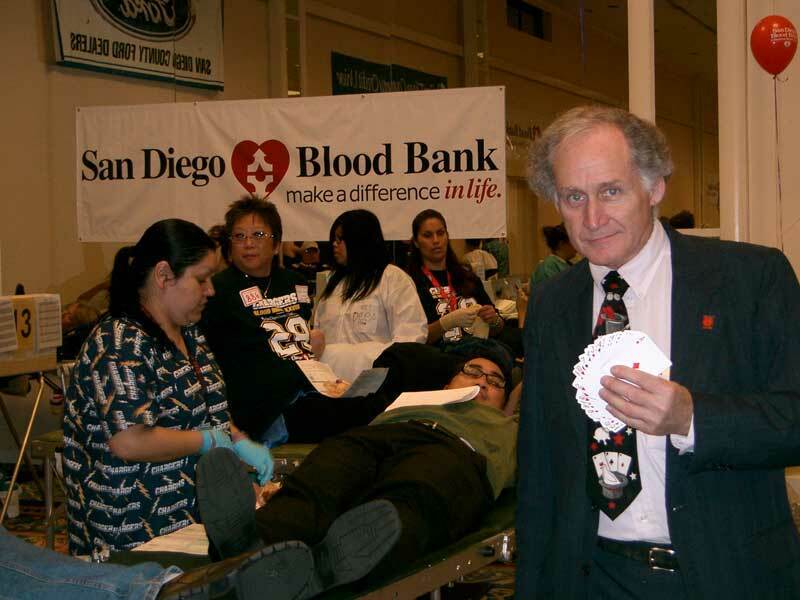 As a 15-gallon donor, Terry knows what it’s like to be a blood donor. 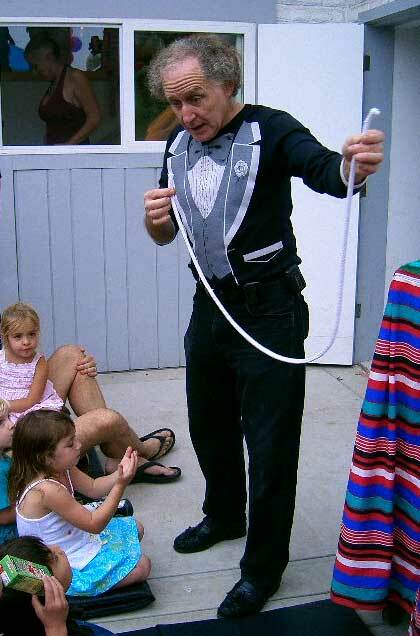 If your child likes to laugh, loves magic, and enjoys being the center of attention, then a MAGIC SHOW with TERRY RUNYON is the entertainment you need to make his or her party extra special! 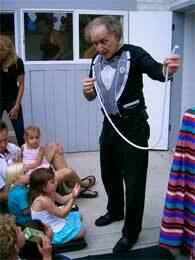 Mr. Runyon’s children's program is 45 minutes of magic geared for children. There's lots of audience participation, focusing on the birthday child and involving several volunteers for each magic effect. The fun starts with “Magic for Muggles” as the birthday child causes a card to rise from a deck using one of Harry Potter’s magic words (hint – it’s “wingardium leviosa”), followed by more Hogwarts-inspired magic, continues with a picture of a shy parrot that magically changes colors, a toy soldier that's a real puzzler, plus Mr. Runyon's parrot, “Clyde the Magical Macaw,” (link to “Animal Performers” page) magically putting charms on a necklace. As the finale, the birthday child turns a paper rabbit into a real live bunny !! IMPORTANT: Please keep the bunny a total surprise from all the kids, including the birthday child! Who would think that a 3-piece puzzle could be so tough? but not the way Terry does it! Surprise! Winchester makes his appearance. Clyde’s not being a good helper. removing the knot from the rope. Don’t worry, this works most of the time! Terry was 7 years old when he was “bit by the magic bug.” It was 1952 and he had just entered Girard College in Philadelphia, PA. 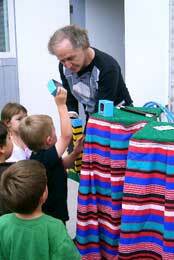 He was treated to a live magic show at the school. 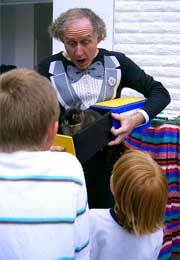 The magician came off the stage and walked through the aisles pulling coins from kids’ ears. He proceeded to drop the coins into a metal bucket, making a loud clanging sound. 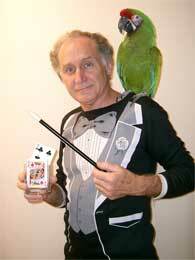 He knew right then that being a magician was what he wanted to be. Fortunately, Girard College had a library larger than many small towns possessed. By the time he was 9 he had read every magic book in the library and knew how to cut someone in half five different ways. In 1976 Terry moved to Buffalo, New York where he was introduced to Eddie Fechter and Karl Norman at Eddie’s “Forks Hotel,” a very famous magic bar. Inside the front door there was a sign that said “Magic Castle East.” Terry performed at the Forks on Friday and Saturday nights, and Karl Norman became his mentor – one of the best teachers a young magician could have. In addition to his membership in the internationally reknowned Academy of Magical Arts at the Magic Castle, Mr. Runyon is also a member of the Society of American Magicians, the International Brotherhood of Magicians, and was instrumental in founding the Magic Guild of Southern California. 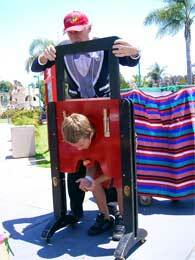 He has entertained children for years at birthday parties all around Southern California, as well as performing at schools, adult parties, hotels, company picnics and other public and private events.